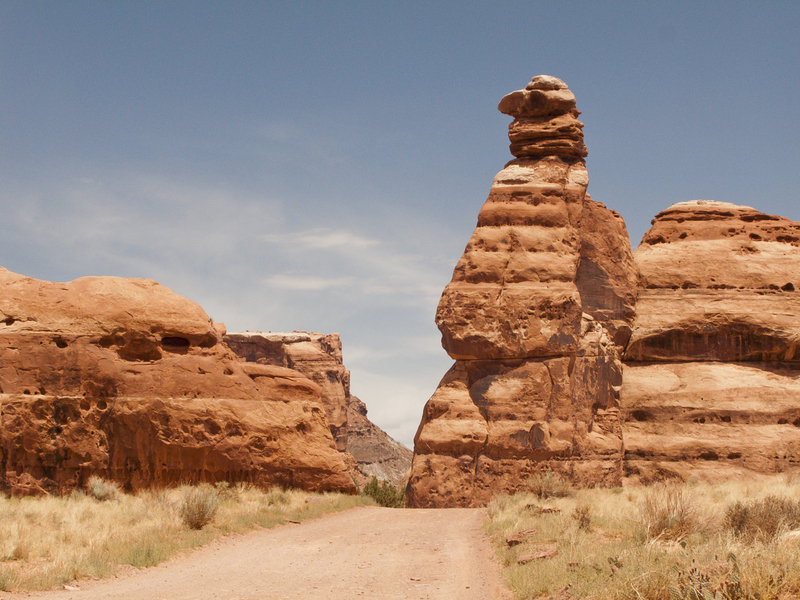 Before the summer got too hot, David and I drove down to the Moab area to spend the day documenting natural arches off of the Short Canyon/Gemini Bridges access road. 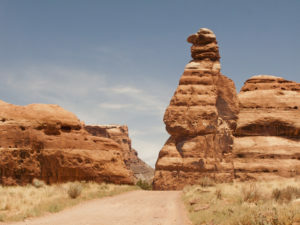 This dirt trail leaves the Moab highway to the west, before dropping down into the Moab Valley and just after the turn off for Canyonlands National Park – Island In The Sky area. The jeep trail climbs the cliffs into the mouth of Short Canyon, which is (was) a rather hidden oasis of pristine desert and canyons. 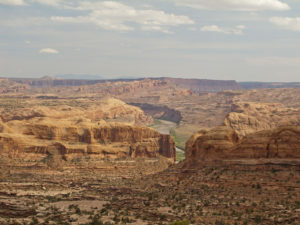 Once into the dry wash of the canyon, there is a short side canyon to the northwest. Near the top of the steep cliffs and rock closest to the road, the Class C natural arch called Lynn-Lin Arch can be found near the top. 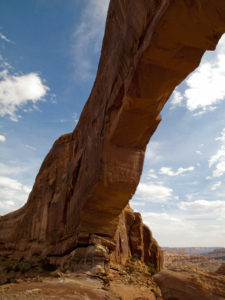 (This is one of my personal favorites though the arch really isn’t named after me.) On this day, we choose NOT to do the gut-busting climb and hike to this hidden treasure. 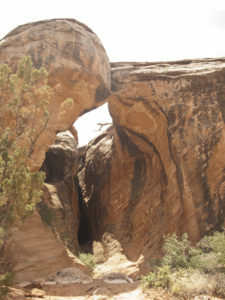 Not far down this Short Canyon, the Class B sized arch called Ojo Arch can be found near the bottom of the west cliffs. 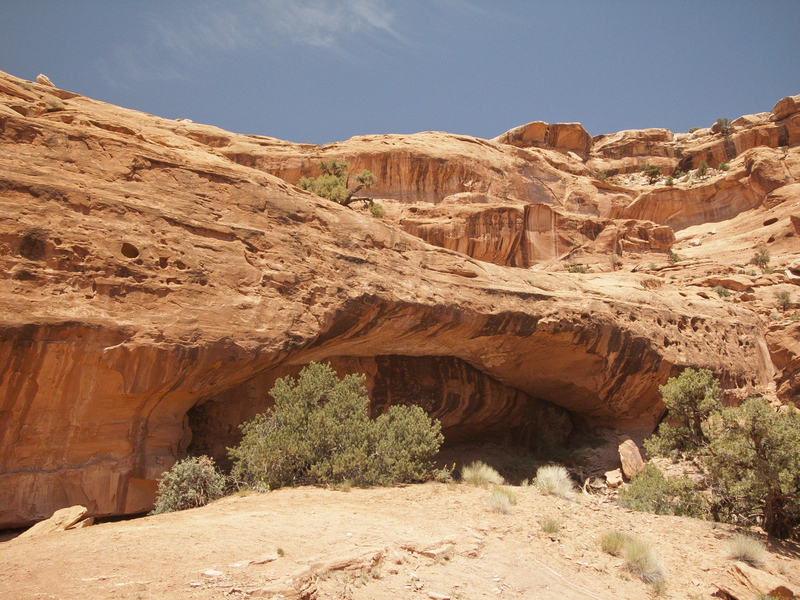 It looks like a cave or alcove from the road but walking up to the cliff will confirm that it is an arch. 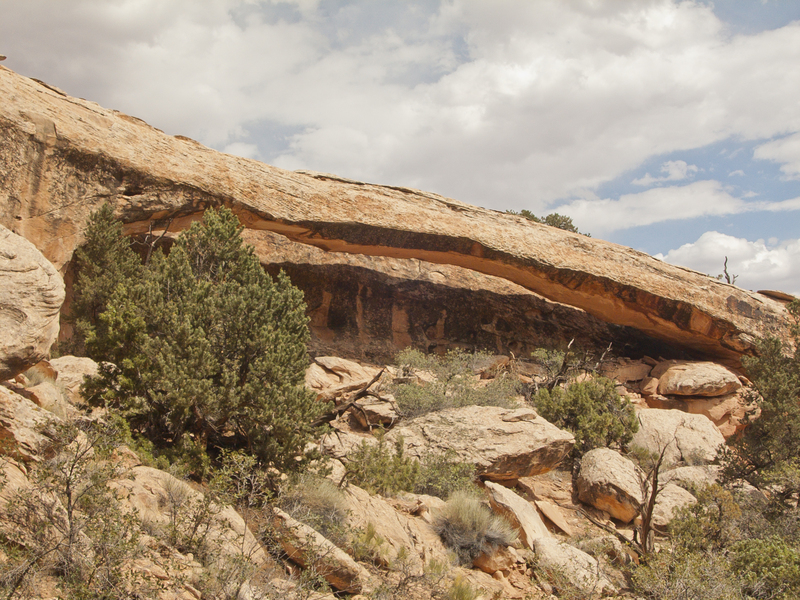 Nearby, on the east side of the road is a small Class D arch called Boulder Arch. 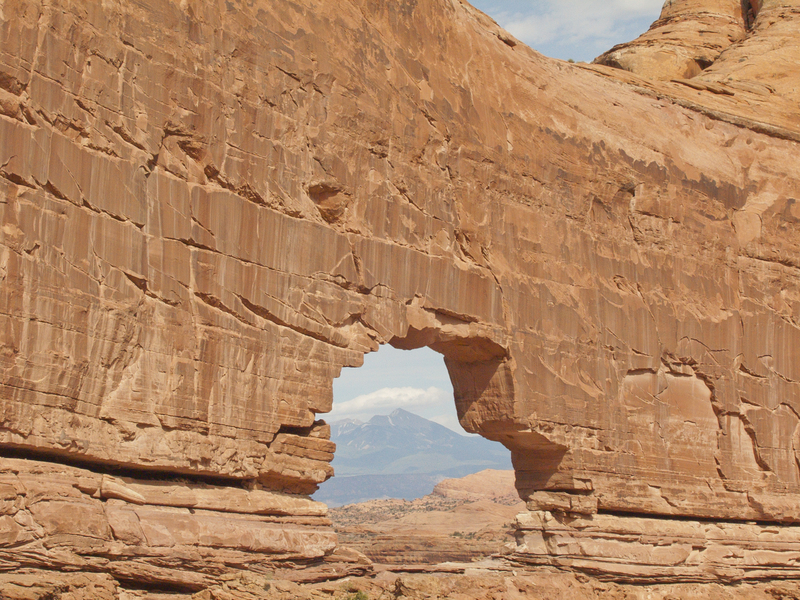 It is almost impossible to notice since you are looking at the arch from its end. Bride Canyon is then on the east with The Bride sandstone formation a short drive up this side canyon. A little further on the main Short Canyon trail, we passed the Goonie Bird, also on the east side of the trail/wash. 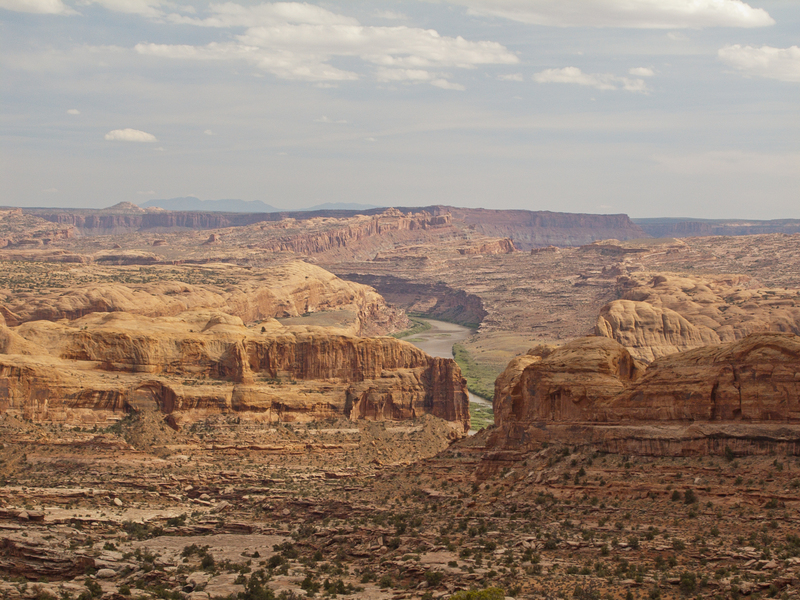 Soon the jeep trail climbs steeply out of Short Canyon and heads to the southwest. 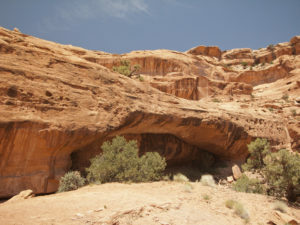 A Class C sized arch called Short Canyon Arch can be found to the west of the wash and almost immediately under the upper part of the steep road. You can view it from both above or below. Instead of climbing steeply out of the Short Canyon wash, we continued in the wash bottom heading mostly east, then south and then east again on the Gold Bar/Rusty Nail trail. After about 1.75 miles we crossed Gold Bar Canyon drainage and then stopped at about 2.25 miles. 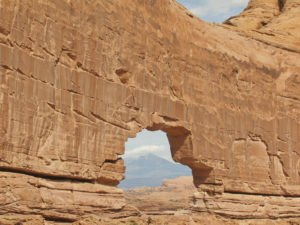 The sandstone monolith on the south side of the trail contains Gold Bar Arch (also called Jeep Arch because of its likeness to the outline of a jeep). The Class B sized arch can be found by hiking either direction around the cliffs. We choose to hike around the west end and return via the east side. 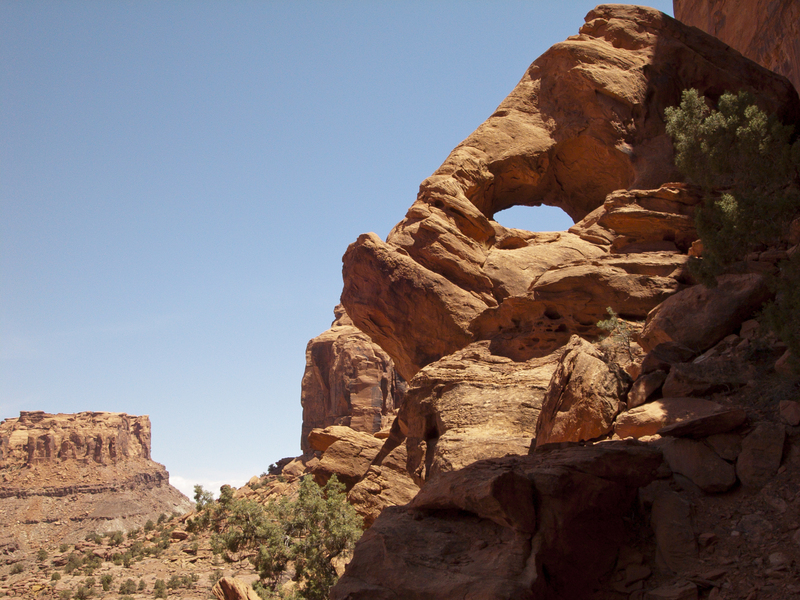 While relaxing in the sun near Gold Bar Arch, we noticed a couple of hikers coming up the drainage from the south. When then got to the arch we started a conversation and found the gentleman and his son were fellow ‘Arch Hunters’ from Germany. They regularly visit Moab to explore and visit natural arches in the area. Back at the vehicle, we still had one more arch we wanted to visit. Where we had parked the vehicle, the cliffs that included Gold Bar Arch was to the south and there was a significant drainage immediately on the north side of the trail. 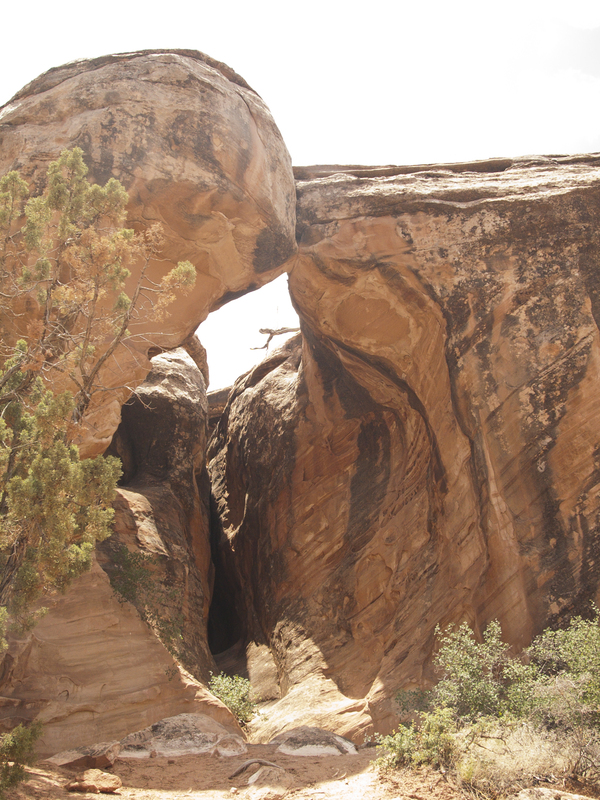 Near the top of the steep drainage there is a Class A sized arch called Barrett Arch. 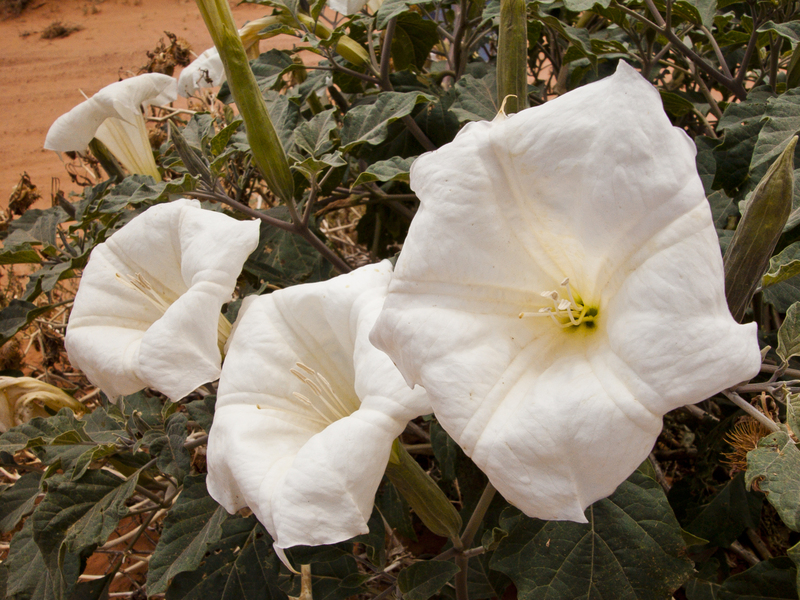 This drainage also provided the perfect conditions for one of my favorite desert wildflowers. 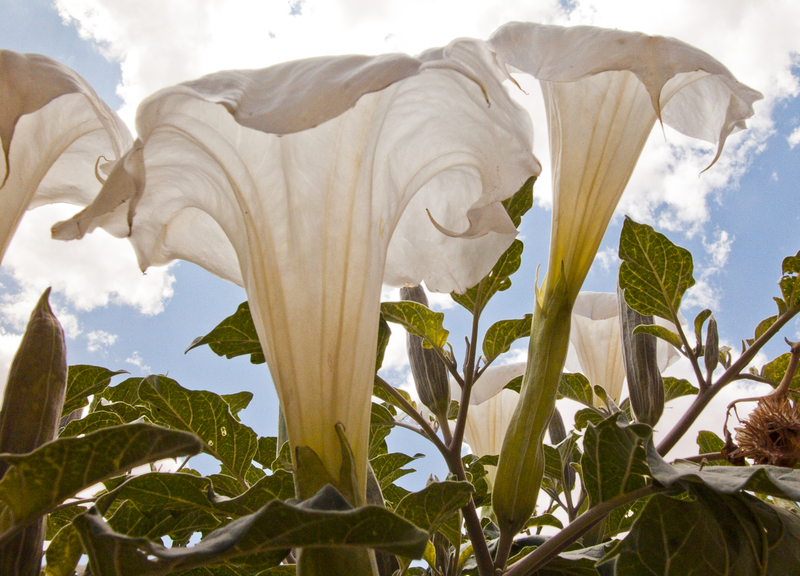 Moonflowers (Datura Meteloides) I believe, are a member of the Nightshade family and the spiky fruit is known to be poisonous. 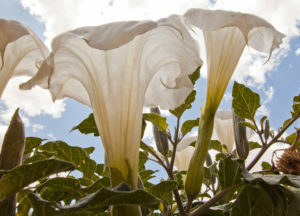 Still, they are beautiful. Another EXCELLENT day in the country I love best. We were tired, mentally renewed and anxious to sleep in our own beds that night so we headed back to the highway and homeward.